Canyoning (BE) or Canyoneering (AE) describes a joung trend sport in which a Canyon is passed trough from top down. Depending on the requirement or the geolocial structure, waterfalls or obstacles are mastered by roping, climbing, jumping or sliding; pools by swimming or sometimes even through diving. The origination goes back decades (back then mostly as expeditions bottom-up) and started mostly in the southern regions oft he alps, Spain and France and even in countries like Australia. The break through in the alpine region came in the last 10 – 15 years. Jointly responsible were the foundation of single unions and clubs, the training for a authorised canyoning guide and a commercialised offer for guided tours. 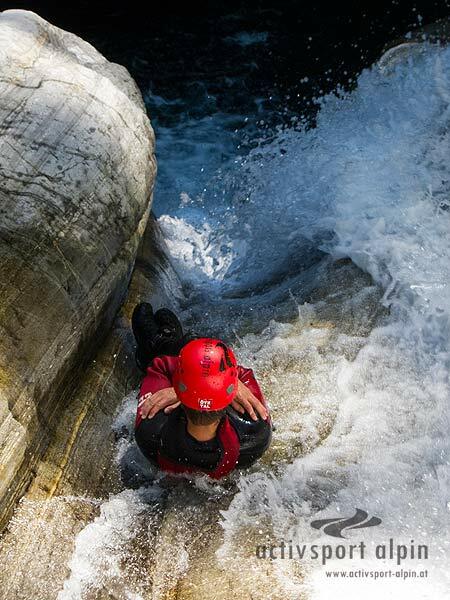 On our page you can find a selection of professional canyoning providers throughout Austria, just choose the region, the provider and let’s get started. https://www.canyoning-profis-austria.at/wp-content/uploads/2016/04/CAPAU-Logo-w-300x197.png 0 0 fstadler https://www.canyoning-profis-austria.at/wp-content/uploads/2016/04/CAPAU-Logo-w-300x197.png fstadler2017-04-12 12:04:132018-12-07 11:24:42What is Canyoning actually? 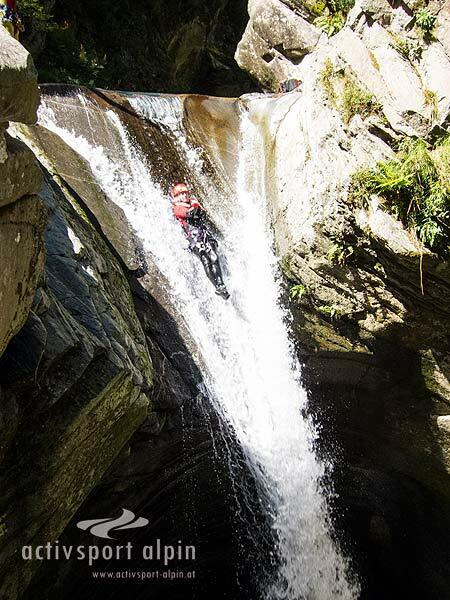 Canyoning is an outdoor sport, which means, canyoning takes place outside almost every were, where water has formed a canyoing over thousands of years. In Europe it is limited to the alps. 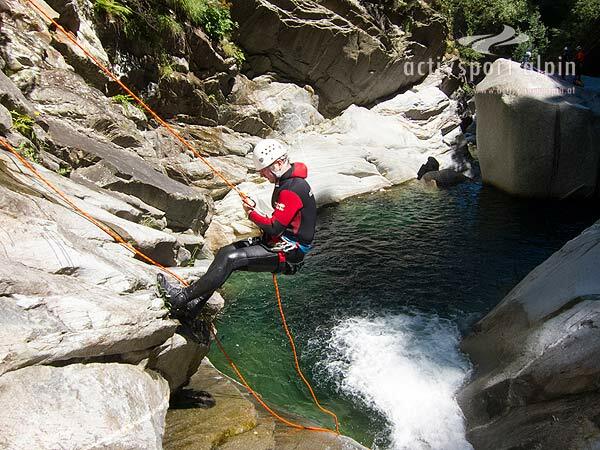 Canyoning is offered in almost all tourism areas. Austria is surely a good address for it, as the nature offers everything form „mild to wild“ and is backened through the state unions with an established training for a canyoning guide. Even worldwide this sport is becoming more and more popular. On our page you can find a selection of professional canyoning providers through out Austria, just choose a region, pick the provider and let’s get started. https://www.canyoning-profis-austria.at/wp-content/uploads/2016/04/CAPAU-Logo-w-300x197.png 0 0 fstadler https://www.canyoning-profis-austria.at/wp-content/uploads/2016/04/CAPAU-Logo-w-300x197.png fstadler2017-04-12 11:56:342017-04-19 16:30:13Where can you do Canyoning? By completing a training for a Canyoning-Guide. Training will be provided by different nations with different prices. Coution is reccomended here with some of them, as there are still many trainings that are not backed through the union or have no legal backing. This would start problems with the insurance company in case of an accident. The authority to give guided tours in other countries or other states can be restricted depending on the training. Therefore we reccomend a training with on of the state representatives of the Österreichischen-Bergsportführer-Verbands. Furthermore a mountain guide (IVBV) can take a training as a canyoning guide or an additional module. https://www.canyoning-profis-austria.at/wp-content/uploads/2016/04/CAPAU-Logo-w-300x197.png 0 0 fstadler https://www.canyoning-profis-austria.at/wp-content/uploads/2016/04/CAPAU-Logo-w-300x197.png fstadler2017-04-12 11:55:592017-05-08 13:01:43How do I become a Canyoning Guide?